If you’re interested in keeping your GM vehicle in tip-top shape, then you have to understand what’s going on under the hood. Fortunately, the easiest way to do that is to buy an OBD2 scanner. Since 1996, these devices have helped car owners across the spectrum inspect and maintain their vehicles, and the technology continues to improve every day. 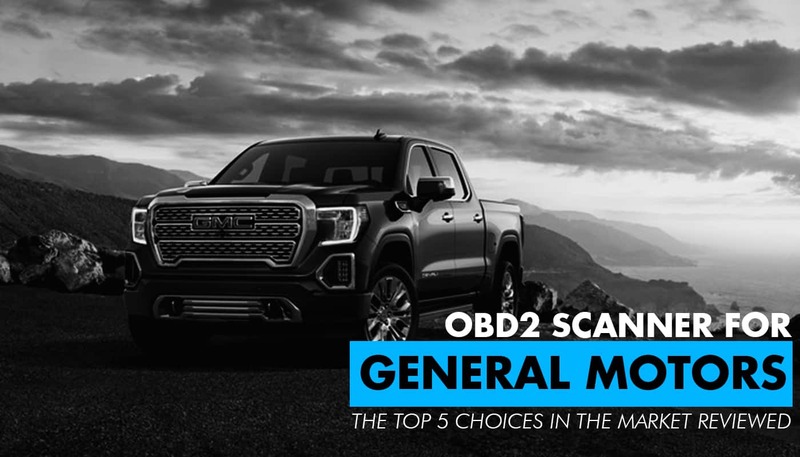 So, with that in mind, we want to take a look at the best OBD2 scanners for General Motors and show what you can do with the right diagnostic tool. When looking at the best OBD2 scanners, you’ll find a couple of different varieties. There are code readers that come with a handheld device, and there are items like this one, that connect to a computer to help you get more from the software. There are pros and cons to each option, but we like what this scanner has to offer, especially for GM vehicles. One thing about OBD2 scanners is that they are usually meant as a generic tool for a wide range of makes and models. While that can be helpful if you have one of the top brands, it also means that you’ll have a bunch of codes that you don’t need. What we like about this model is that it’s designed specifically for GM. This means that you don’t have to worry about compatibility issues or not having the right codes for your car. Although the primary purpose of these scanners is to tell you what’s wrong with the engine, sometimes they can also give you a glimpse at the overall performance of your vehicle. In this case, freeze frame data can provide a snapshot of what’s happening, which can help you diagnose the overall health of your car. While it’s not the same as real-time scanning, it’s better than nothing. The software on this scanner is high-quality, and we appreciate that it’s designed for GM cars specifically. Also, we like that you can connect it to any PC. If you have an older GM vehicle, you may not have all of the codes you need. Also, it doesn’t work on Macs, so keep that in mind. When it comes to software-based scanners, nothing really compares to TOAD. The name stands for Total Onboard Auto Diagnostics, and you’ll see that this unit lives up to its title. Although this is a “generic” scanner, meaning that it comes with codes for a variety of makes and models, you’ll be impressed by the fact that you’ll have access to everything that GM offers. Since the software is updated all the time, you’ll never be out of date or have the wrong codes. What sets TOAD apart from other scanners is that you can be more proactive about your diagnostics. By connecting to your car’s onboard computer, you can both monitor and improve its overall performance. Most other scanners do not have this capability. If you’re serious about keeping your GM vehicle in excellent shape, then TOAD will ensure that you can do that. It’s a professional-grade system that will never become obsolete. Also, we appreciate that it comes with repair manuals and online forums. New OBD2 scanners usually allow you to monitor other vehicle systems, like airbags, brakes, and tire pressure. Unfortunately, TOAD only manages your engine, so you’ll have to get another device to check on those parts of your car. As we mentioned, you can find scanners that are either handheld code readers or software-based options. This unit from iCarsoft is the former, which makes it both convenient and easy to use. The best thing about having a small, lightweight code reader is that you can keep it in your vehicle. Since you don’t have to rely on a laptop to scan your car, it’s much easier to manage your diagnostic capabilities. With basic scanners, you can simply look up vehicle codes and reset the dash lights. Fortunately, with this system, you can also monitor your car’s health and performance in real-time, which gives you valuable insight into how well it’s operating at any given time. As far as handheld readers go, this one is highly portable and convenient. While it’s not as powerful as some other models out there, it’s more than capable for most GM owners. When connecting to your computer for updates, you may experience lags and connection issues. Also, since it’s not built for GM specifically, it may not be fully up to date on all of the codes. If you like the idea of having a handheld OBD2 scanner, then Innova is one of the better brands you can buy. This model is one of their top devices, meaning that you can do a lot more than you might think. As we mentioned, many newer scanners allow you to check additional systems beyond the engine. Thus, if you want to monitor things like airbags, brakes, and tire pressure, this unit will enable you to do so. Keeping an eye on your car’s health has never been easier. Compared to other handheld devices, this one has a much larger and easier to read screen. Navigating through the menus is simple and efficient, and you can see what the codes mean much more easily. This is an all-in-one handheld scanner, meaning that you shouldn’t need any other diagnostic tools for your GM vehicle. Also, it has some bonus features that make it easier to use, like LED-lighted connectors to help you see what you’re doing. GM has a lot of codes for their makes and models, and many generic code readers like this one may not have all of them, so be aware of that. Also, the software can be glitchy at times, although it’s not much of an issue overall. Our final OBD2 scanner is another handheld model, although this one is designed to provide some additional features that will help you maintain your car more efficiently. Let’s see what it has to offer. One of the most valuable features of any OBD2 scanner is the ability to monitor your car’s health in real-time. Seeing how the engine and other systems are performing while the vehicle is running can help you diagnose issues long before they show up as dashboard lights. With most code readers, you’ll get a short description of the problem. With this one, however, it will tell you where the issue is located so that you can pinpoint it faster. Rather than having to look up the component’s position in the engine, you’ll see it on screen immediately. The simplicity and diagnostic power offered by this scanner are incredible, and it will help you make the most out of your purchase. We really like the location directions, as well as the size and capability of the screen. One nice feature is that the reader will automatically detect your vehicle’s make and model. Unfortunately, this doesn’t always work correctly, which can be a pain if it gets the information wrong. Also, it may not have all of GM’s codes. Overall, when trying to pick out the best OBD2 scanner for GM vehicles, we like models that are built for this particular brand. While generic devices can work well, it’s better to get a model-specific scanner so that you can be sure that you’ll have access to all of the right codes. So, with that in mind, we highly recommend the VXDIAG VCX Nano GDS2 and Tech2Win. Although we’d prefer if it had a code reader device, the fact that you can plug it into a computer or tablet offers a broader range of performance options. If you prefer something a bit more comprehensive, then TOAD is going to be your best option. This software is the total OBD2 scanning package, and we love that it’s packed full of diagnostic and repair features. Also, since it’s professional grade, you won’t have to go to the mechanic whenever a dash light comes on.